Description: View of the chapter house and cloister. 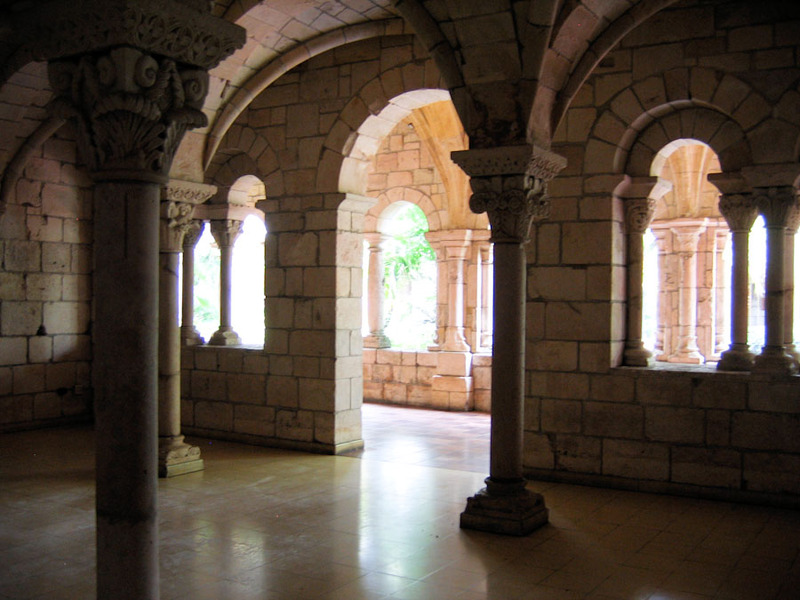 The Cistercian monks of this ancient monastery began their days at midnight with a morning prayer service and another service at 3am. These services would take place in the dark until the use of candles began in the 14th century. The services could last until dawn, or if not, they would go back to sleep and wake up at 6am. At 6am they would bathe and attend another service followed by instructions for the day. Private mass or work would then be done until 9am, at which there was High Mass. Lunch would be at noon followed by free time until 3pm. From 3-6pm the monks would perform manual labor after which there would be an evening prayer. The night prayer was said at 9pm. After this prayer the monks could go to sleep until beginning again at midnight. TIFF File: A high resolution TIFF of Chapter House (28.9 Mb) is available for download. This is a very large file suitable for printing. For most on-screen purposes, you should use the image displayed on this page instead of this TIFF.